All information in this section was written by Miranda Bone. Miranda is a Nutritionist, with a Bachelor of Human Nutrition from the University of Canberra and now lives in Melbourne. She is especially interested in Veg*n nutrition, preventative health care and whole foods. You can contact Miranda directly via email miranda.bone@gmail.com if you wish to ask her nutrition questions. 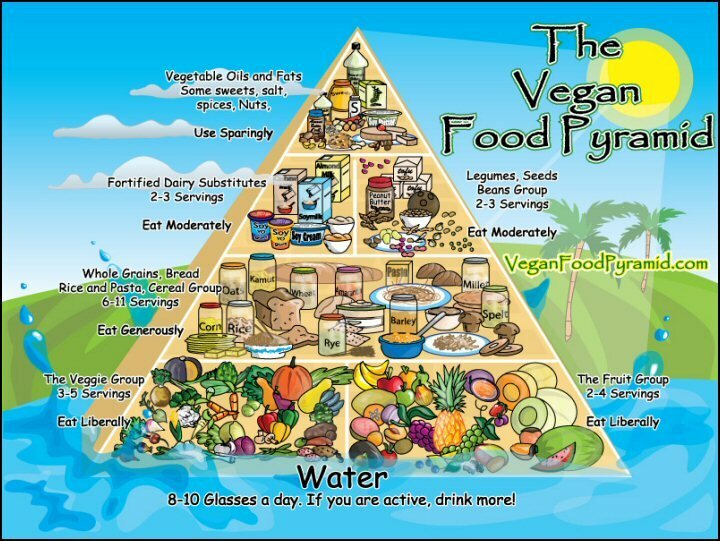 The ‘Basics’ Being a well and healthy vegan needn’t be difficult; and for most of us, it isn’t. But sometimes, especially when transitioning from an omnivorous diet, there can be problems. Often, a knowledge of the vegan basics will help. The American Dietetic Association has stated that a well planned vegan diet is nutritionally appropriate for all stages of the life-cycle. So what are the keys to planning a vegetarian diet well? Variety and Balance. The mainstay of a vegan diet breaks down into 3 groups: Fruit and Veg, Grains, Proteins. How much of each of these groups we should eat varies with the individual; choosing a variety of food from withing each group helps ensure we get all the nutrients we need. Proteins Generally, we eat enough protein to keep them healthy if we eat enough calories. 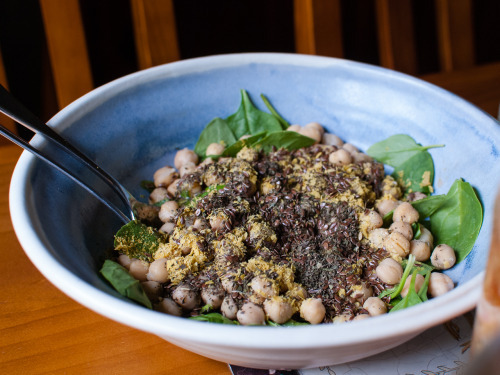 Vegan foods with plenty of protein include beans, tofu, and bread, with around 10-15 g protein per 100 g food, and nuts & seeds (including tahini, peanut/almond/cashew butter) which have around 20-25 g protein per 100 g food. So called ‘meat analogues’ or vegan meats can also be used to add variety in the diet; their protein content is very variable, depending on the type and brand. The National Health and Medical Research Council suggests adults need 50-65g of protein daily – that’s 1-2 cups of these protein rich foods – easy!. Grains (and potatoes) Grains are a rich source of carbohydrate; they bulk out a meal, and add energy. It is best to choose whole grains and whole grain products, the less processed the better, as these provide fibre, vitamins and minerals along with the energy from the carbohydrates. Grains are also a source of protein complementary to nuts, seeds and beans. They provide amino acids which the body needs, but which the other, more protein rich foods, lack. Eat grains in proportion to your energy needs. Fruit and Veg Eat lots of these!! The more fruit and veg you eat, the better (as long as you get enough calories). Fruit and veg are excellent sources of vitamins and minerals as well as fibre. Current recommendations are to eat about two serves (or two handfuls) of fruit, and five serves of veg (one serve is 1/2 cup vegies, or 1 cup salad leaves) every day. Eating more than that is fine; some research has suggested eating 8-10 serves of vegies for optimal health. There are lots of ways to eat your fruit and vegies: in salads, dried, chopped or whole (as a snack), blended in smoothies, cooked as sauces, soups or side dishes. Try to eat a variety – a good rule of thumb is to eat as many colours as you can, and not to cook the colour out of them. Green vegies (spinach & other leafies, brocoli, brussel sprounts) are especially important for vegetarians, as they are a source of iron, and vitamin C, which increases its absorption. Include also, some healthy fats and oils (instead of saturated or trans fats). 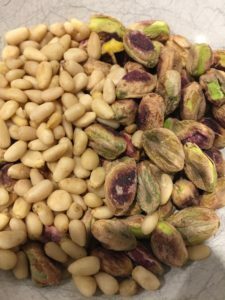 Cook with olive oil; use canola oil in baking; eat nuts and seeds. Try flaxseed oil (but don’t heat it). These help to keep your heart (and brain) healthy. You’ll probably want to eat some ‘junk’ food – and there’s plenty of empty vegan calories available (chips, chocolate, two minute noodles). 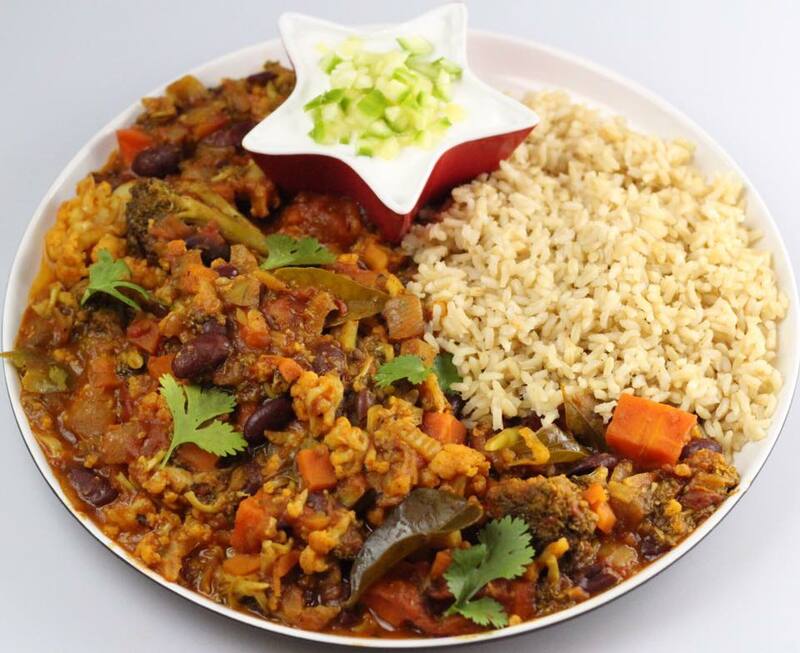 This is ok, if you don’t overdo it, but the ideal would be to find more nutritious ways to indulge yourself…. good quality dark chocolate and fresh fruits, or hummus and veggies, for example. When you make changes in your diet or exercise, keep an eye on your weight. If you start consistently losing weight, and you don’t want to, increase how much you are eating from the Grains and Proteins groups. If you are gaining weight (and shouldn’t) add more fruit and veg, and cut out ‘junk’ food. You may also find it useful to buy vegan cookbooks which feature healthy recipes, or to browse online recipe forums. This can help to give you a healthy pattern of eating that’s right for you, so you don’t have to think about eating healthy – you just do it. A well planned vegan diet can easily supply your daily protein needs. Legumes, grains, nuts, seeds, plant-based milks and vegetables are all good sources of protein. However a vegan diet can also fall short in protein if it relies too heavily on fruit (like in some raw vegan diets) or incorporates too many vegan processed foods (confectionary, crisps, biscuits, refined foods). Protein needs are very individual and are related to factors such as body mass, activity and age. Protein needs are greater if you are pregnant or breastfeeding. There are also some medical conditions that increase your protein needs. Speak to a health professional if you need help working out your protein requirements. An average weight male will need a minimum of 60g protein per day. Let’s take a closer look at the protein content of some common vegan foods and see how easy it is to achieve this goal. It is better to get your protein from whole foods as they contain other key nutrients such as iron, zinc and calcium. If you rely on protein powders to reach your protein target it can be harder to meet your requirements for these other vital nutrients. However, there may be times where a protein powder may be useful. Vegan athletes, growing teenagers or elderly vegans may find a protein powder can help meet their higher protein needs. Vegan protein powders are based on plant proteins such as pea, soy and rice. Such supplements provide between 15 and 25g protein per serve. Anyone who is vegan or getting close should be taking a vitamin B12 supplement or suitably fortified foods. Do some reading about nutrition, for example www.veganhealth.org and Becoming Vegan by Melina & Davis. B12: A Magic Pill, or Veganism’s Achilles Heel? Contact Us if you need further help.